After the apocalypse, there are only a few thousand people left and they’re scattered across the world. One of the survivors is a teenage boy named Griz, who lives with his family and his dogs, Jip and Jess, on a remote island off the coast of Scotland. 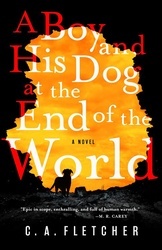 When a strange traveler steals Jess in the middle of the night, Griz sets out on a life-changing journey through the ruins of a fragile civilization to bring his beloved dog home. Along the way, he’ll witness kindness and cruelty beyond anything he ever thought possible. This fiercely compelling tale of survival, courage, and hope is perfect for readers of thoughtful and thrilling fiction, such as Station Eleven, The Girl with All the Gifts, and The Life of Pi.